This quote encapsulates what Chef Stephanie Zubiri-Crespi is trying to do with her little restaurant that could. On a recent visit, C and I decided to start with one of our favorites: Un Peu De Verdure. 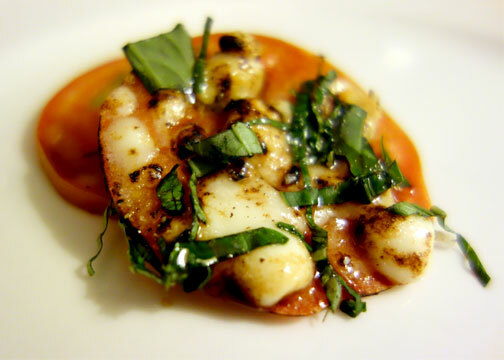 A flaming Kesong Puti (white cheese made with goat’s milk) Caprese, that has a reduced oil and balsamic dressing. (P280). We have always loved this salad for its simplicity and smoky flavor. The tomatoes that were used were good sized and crunchy while I have been always been partial to Kesong Puti for its tartness and creamy texture. For our mains we decided to have Stephanie’s latest inspiration, Sri Lankan Black Curry Chicken with Cardamom and a Fried Eggplant Raita. (P550). 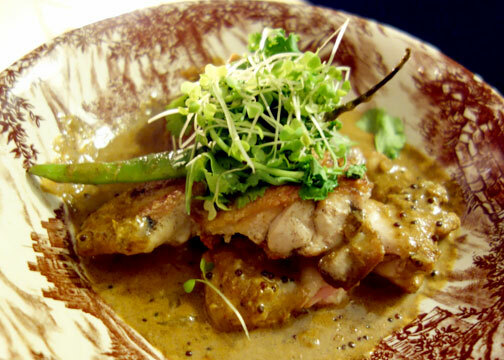 The curry sauce was a revelation of flavors that gave us a taste of old Ceylon. My favorite though was the raita. Plain yoghurt served with mustard seeds, curry leaves, crunchy eggplant pieces and a dash of oil, was reminiscent of a similar dish that my grandmother used to make back in the day. Bravo! 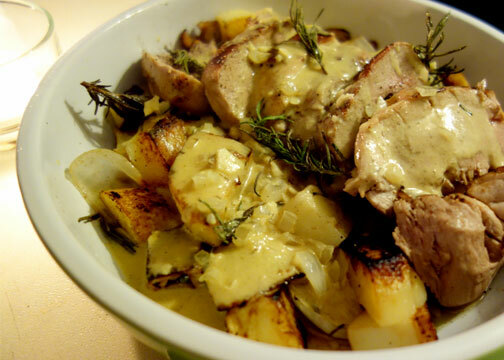 Our other entrée was a Rosemary Mustard Roast Pork Tenderloin Served with Potatoes and Apples P850. According to Stephanie, this was an old family recipe that she borrowed. Flavors were well balanced with the mustard, apples and pork sharing equal billing. More importantly, the pork tenderloin slices were moist; something many other restaurants that I have been eating in recently, have had a hard time accomplishing. As it was just the two of us, we decided to forego dessert. We will leave our favorite Pumpkin and Ginger Cake with Cream Cheese Frosting (P150) for another visit. I have been witness to the growth of Atelier 317 since its inception. I thought that even if it was a work in progress initially, improvement has been constantly on the rise. It is still by no means perfect, it is however evident that every plate is cooked with love. This makes it a standout among others. Atelier 317 is now closed. I'm not surprised that it closed. We had a bad experience - service was bad and food was so-so. This was a few weeks before it closed. Table for Three, Please has Gone Pro!